Longtime Real Change vendor Karen Norcross passed away recently, of complications related to heart disease. She was 58. Her death took many by surprise. Karen’s outgoing nature made her a natural vendor. “She liked being out and meeting people and seeing all her repeat customers and getting a chance to get to know them,” said her son, Jason Norcross. Selling Real Change gave her a sense of pride and the opportunity to connect with people. Jason, an only child, said his mom didn’t have an easy life. After losing her job at the Dept. of Social and Health Services (DSHS) they lost their apartment in Kirkland and moved to the Union Gospel Mission. Now 37, he was 10 years old at the time. They lived at the mission for a few months. The experience made a deep impression on him. Jason said his mother was a forthright, opinionated woman who remembered what is important in life. 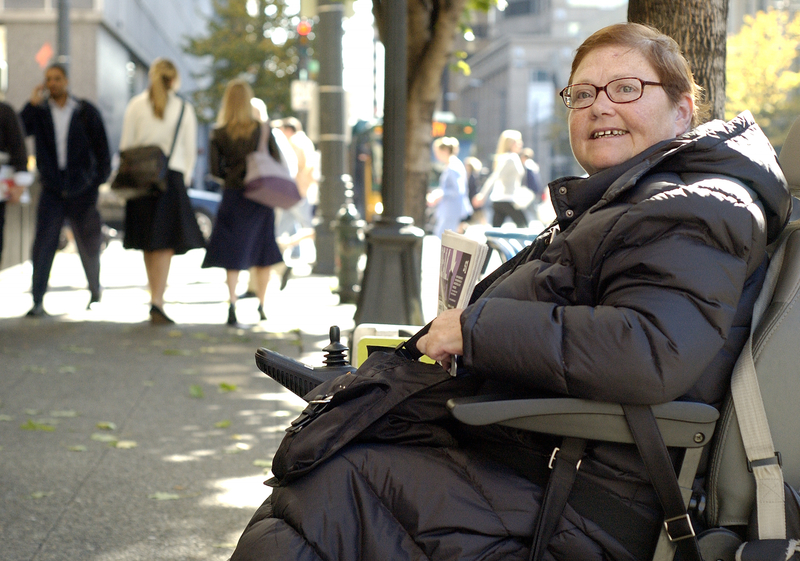 She used an electric wheelchair, but that didn’t keep her from getting out and meeting people and going to one of her favorite places, the Pike Place Market. Karen loved cheesesteak sandwiches, playing bingo and hanging out with her friends. Abdi, her caregiver for the past 18 months, said she also loved to cook, but it was painful for her to stand up in the kitchen, so Abdi would help by chopping things up for her. She loved spaghetti and meatballs and green beans. “She’d have that everyday if she could,” Abdi said. She was an avid watcher of QVC. On Wednesdays, Karen would often compare her purchases from the shopping channel with fellow RC vendor Susan Ford. Karen would always ask Susan to put her papers in her backpack for her. They would go outside and share a cigarette and chat. “She was always trying to run me over with her wheelchair, joking with me that I better have insurance. It was a long-standing joke between us,” Ford said. Most of all, Karen loved the Seattle Mariners. Sometimes she went to day games by herself. Sometimes she went with her son. Always, she followed the team. Karen Norcross was the Real Change Vendor of the Week in the July 18, 2007 issue. Karen’s Leaf is located at Real Change.